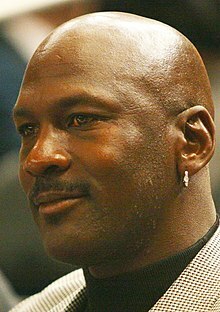 Michael Jeffrey Jordan (born February 17, 1963), also known by his initials, MJ, is an American retired professional basketball player, businessman, and principal owner and chairman of the Charlotte Hornets. Jordan played 15 seasons in the National Basketball Association (NBA) for the Chicago Bulls and Washington Wizards. He is widely considered the greatest basketball player of all time. I can accept failure. Everyone fails at something. But I can't accept not trying [no hard work]. I've reached the pinnacle of my career. I just feel that I don't have anything else to prove. When I lose the sense of motivation and the sense of 'to prove something' as a basketball player, it's time for me to move away from the game of basketball. Announcing his retirement from the Bulls (1993-10-06) Classic NBA Quotes: Michael Jordan. NBA Encyclopedia. NBA Media Ventures. Retrieved on 2006-11-24. I'm back for the second time. Announcing his return to the Bulls (1995-03-18), Classic NBA Quotes: Michael Jordan. NBA Encyclopedia. NBA Media Ventures. Retrieved on 2006-11-22. I'm retired 99.9%. Of course, there always is that .1%. Statement of 1999-02-18 Classic NBA Quotes: Michael Jordan. NBA Encyclopedia. NBA Media Ventures. Retrieved on 2006-11-22. There will be a player greater than me. Enjoy every minute of life. Never second-guess life. (In 1985, Jordan broke his foot and the management, namely Jerry Krause, wanted to limit his return for fear of worsening the injury - the idea was to play seven minutes in each half) The [Bulls] came up with this whole theory you can play seven minutes a game when I'm practicing two hours a day... I didn’t agree with that math. I wanted to play. I wanted to make the playoffs. [...] Jerry [Reinsdorf] said, "Let me ask if you had a headache and" - there was a 10 percent chance then I’d reinjure my ankle - "and you've got 10 tablets and one of them is coated with cyanide, would you take it?" I looked at him and said, "How bad is the headache?" Jerry looked at me and said, "I guess that's a good answer, you can go back and play." As a proud American, a father who lost his own dad in a senseless act of violence, and a black man, I have been deeply troubled by the deaths of African-Americans at the hands of law enforcement and angered by the cowardly and hateful targeting and killing of police officers. I grieve with the families who have lost loved ones, as I know their pain all too well. I was raised by parents who taught me to love and respect people regardless of their race or background, so I am saddened and frustrated by the divisive rhetoric and racial tensions that seem to be getting worse as of late. I know this country is better than that, and I can no longer stay silent. We need to find solutions that ensure people of color receive fair and equal treatment AND that police officers – who put their lives on the line every day to protect us all – are respected and supported. If we all work together, we can foster greater understanding, positive change and create a more peaceful world for ourselves, our children, our families and our communities. Magic Johnson, quoted in Classic NBA Quotes: Michael Jordan. NBA Encyclopedia. NBA Media Ventures. Retrieved on 2006-11-22. I think he's God disguised as Michael Jordan. Boston Celtics forward Larry Bird, after beating the Bulls in a 1986 Eastern Conference first-round playoff game that ended in 2OT, a game in which Jordan had scored 63 points. Quoted in Joel Achenbach (1999-01-15). "'This Is a Perfect Time for Me to Walk Away'". The Washington Post: p. A1. Retrieved on 2006-11-22. "So, it's the Cavs 5, and Jordan 4." "…Daugherty grabbed him, and Jordan put it in anyway - he is unbelievable." "…he is so strong that he can shoot and score with people actually having their hands on the ball, as Ehlo did that time…"
Bulls head coach Doug Collins on The Shot, quoted in the NBA Encyclopedia. Felton Spencer, quoted in the NBA Encyclopedia. Marv Albert, quoted in the NBA Encyclopedia. Michael and I combined for 57 points. Teammate Bill Wennington, referring to The Double Nickel, a 55-point scoring performance by Jordan against the Knicks, on March 28, 1995, Jordan's fifth game back in the league. He didn't miss games. He played hurt, with pain, when he was sick. He came out and performed at an intense level. I don't think anybody ever went away disappointed after watching Michael. Bulls Chairman Jerry Reinsdorf, quoted in "Michael Jordan Retirement Press Conference" (transcript). NBA Media Ventures. 1999-01-13. Retrieved on 2006-11-22. Number 45 doesn't explode like Number 23 used to. Nick Anderson, quoted in an interview after Game 1 of the 1995 Eastern Conference Semifinals on May 7th, 1995. This page was last edited on 16 January 2019, at 02:45.